Birmingham's dream of Champions League glory was ended in a 3-0 defeat by Swedish team Tyreso in the second leg of their semi-final. After a goalless draw in the first leg at Solihull, Blues were beaten with a Christen Press brace and Marta goal. 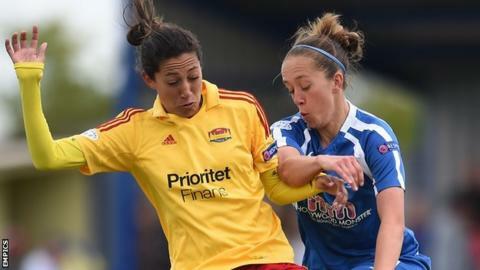 But Brazilian Marta, who also missed a penalty, was lucky to stay on the pitch after what appeared to be a 28th-minute stamp on right-back Chelsea Weston. "We're out of the competition, but it's been a fantastic achievement to get this far and we aim to be back." "It was a clear stamp by Marta," said Birmingham manager David Parker. "The referee didn't see it, but the fourth official did and chose to do nothing about it. "Tyreso ended up having most of the possession, but we defended with our lives and I'm immensely proud of the players. "We're a very young team that's gone up against some of the best players in the world and the girls can hold their heads high." Parker, on his 30th birthday, saw his team start brightly and midfielder Jo Potter had a fourth minute shot blocked. But the visitors were pushed on to the back foot as the Swedish side began to dominate possession. Blues goalkeeper Rebecca Spencer had to make a fine save from a close range Marta shot and Spencer then did well to keep out a diving header by Press. Blues were having to defend in depth to keep their goal intact. But, four minutes before half-time, they broke out for midfielder Remi Allen to have a 20-yard drive saved by keeper Tinja-Rikka Korpela. They were lucky not to go behind four minutes after the break, however, a hand-ball by Weston leading to the penalty. Marta uncharacteristically smashed the spot-kick over the bar and Blues breathed again. Another escape arrived in the 55th minute as Spanish striker Veronica Boquete's 15-yard shot hit the bar. But Blues' resistance was finally broken in the 61st minute, Press squeezing her way between two defenders to slide the ball past Spencer. And there was no coming back after Press had forced in her second goal following a Marta cross 18 minutes from time. Marta swapped passes with Press before striking in the final goal three minutes into stoppage time.